Are you ready, skee-daddy?! 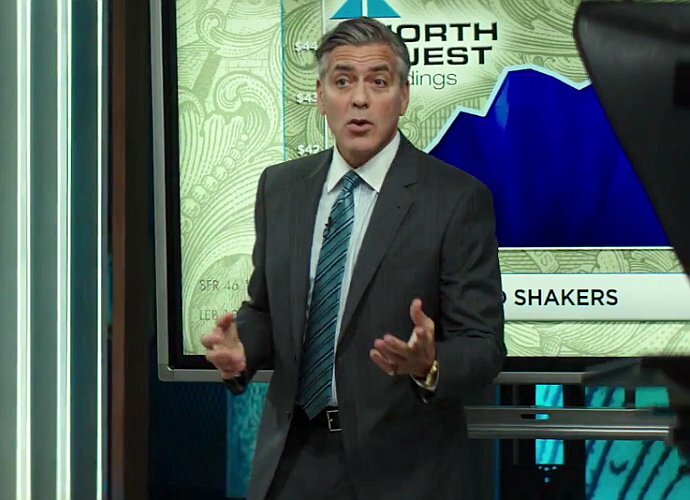 TV host Lee Gates (George Clooney) is a big-time personality, hosting Money Monster, a show that suggests stocks and companies its viewers should invest in. Along with his producer Patty (Julia Roberts), they’ve combined to make the show information, flawed or not, that many people take as the gospel. Sadly when that happens sometimes, people get burned. One “burnee” in particular, Kyle Budwell (Jack O’Connell), wants answers after making a failed investment. Undetected, he makes his way onto the set of the show and gives Lee an ultimatum: Find answers quickly, or die due to explosion via bomb strapped to chest. All Lee can do in an effort to stay alive is to talk with Kyle and keep his emotions in check, while Patty races against time to find out exactly what happened with the company Kyle invested in. These days, and rightfully so if the last 10-15 years are anything to go by, one can’t hear Wall Street without thinking immediately of corruption and the mostly pompous one percent in the same thought. As such, its given a ton of material for studios to make films out of, parlaying the real life happenings in the NYC financial district into biographies, or using them as inspirations for screenplays set in real life locales but otherwise fictional in story. 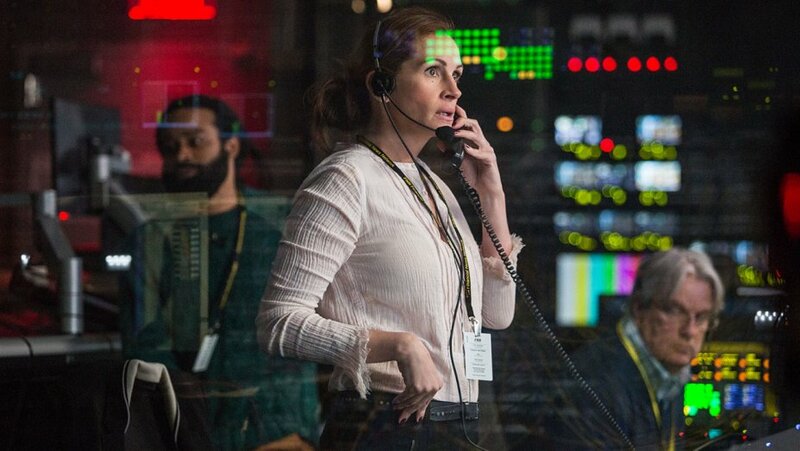 Money Monster is the latest in the Wall Street-centric films on the fictional end of the spectrum, and though there are some moments to buy, others are better being held or selling. In her first directorial credit since 2011’s The Beaver, Jodie Foster gives Money Monster a solid layer of tension, even with a trailer that seemed determine to show every little key detail of the plot (feel like I’ve seen it at least 10 times over the course of four months, not counting TV spots). So much of the story unraveling on the set of a television show and news feeds allows Foster to use different shots to ramp up the tension, and a good score by Dominic Lewis (produced by Henry Jackman) helps as well. In a way, it feels a little like Vantage Point, without the multiple characters seeing the same event in a different way. Another good point? Foster keeps the movie manageable from a runtime. For the most part, the pace moves well. Where Money Monster drops in stock price is script. By no means is it bad, but there is the feeling that hit yours truly midway through that the drama, nor the thought-provoking elements, stick that well. Take out the jumbled business about quants, political uprisings, etc, and what is left is what that is expected. Part of that could just be a personal issue; hearing about white crime and corruption kind of dulls the impact of the message. I know it exists, and I care but I kind of don’t as well. Satire is a word that is being attached a lot to this movie, and though it kind of hits its mark with how the Clooney character is, I just don’t see it as a whole. Perhaps tone is a small issue. There are some more lighter bits than anticipated, and a few do work (you’ll know one in particular when you see it), but others feel so random and extremely out of place given the matter at hand. 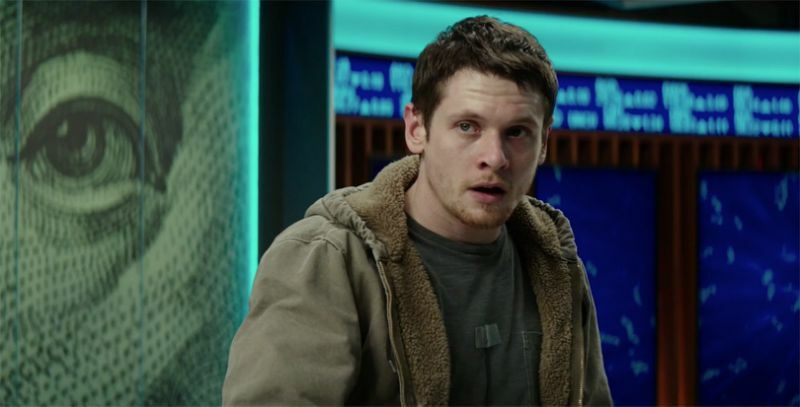 When it comes down to it, the Kyle character played by Jack O’Connell never completely drew me in, or more accurately, his plight and how he goes about it never registers emotionally. He’s a little hit and miss with his accent, not a caricature but not a complete character, either. However, the real problem is that the writing does him little favor, and little sympathy is felt for his misfortunes. He ends up coming off as a hothead who, while not all his doing, is just as much to blame as those he is blaming. Still, the movie is saved somewhat by its two biggest stars, Roberts and Clooney. Forget that they are almost never in the same frame, it’s even more surprising that the two were hardly ever on set at the same time, which makes the chemistry they forge all the more impressive. These are the types of roles Roberts will likely see the rest of her career, but she’s more than reliable in them. Clooney, until the day he dies, is always going to be a star, and his cool charisma is ever-evident here, as well as his ability to draw sympathy for his elitist character. Wake up and smell the coffee. 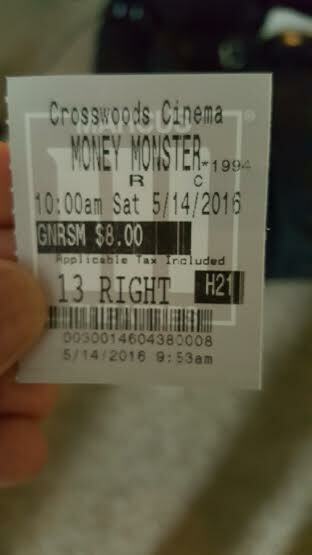 As a popcorn-thriller at matinee price, Money Monster can be entertaining from that mindset. Looking for a smart-thriller and good satire, however, could leave one regretting their decision. Boo-yah?! Photo credits go to yahoo.com, hollywoodreporter.com, and aceshowbiz.com. Thanks Tom. I wish I could have could have found more appreciation for it, but I do love Clooney in this. Dude is simply a star. George Clooney has become so sanctimonious. I think I’ll pass. Nice review. Confirmed my thoughts. Good point. It is very hard to buy, however fictional the story is, the participation of such wealthy stars in such a production about the 1 percent and greed. I enjoyed Clooney here, but a weird disconnect does exist. Hmmm, I watched the trailer for this and kinda winced. Your review pretty much sums that up! Kind of just there. For me personally, didn’t stick with me like a comparable film did, The Big Short. This one fell flat for me, for pretty much exactly the reasons you mentioned. Good review! It was better than I expected based on the trailer, which pretty much gave you the whole plot and made the movie sound extremely preachy. Still was, but a little more toned down I thought it’d be. I think there are solid style ideas here–thriller, critique, satire, etc.–but they never gel. Not mad that I watched, but in hindsight, not really worth a theater view. It’s not bad as you allude to and there are some good things going, but it never does gel.